When it comes to pricing, promotion, and consumer goods distribution services, the pinch that brands have felt from retailers in recent years is only getting tighter. As retailers themselves feel pressure to lower prices and offer service upgrades to remain competitive against eCommerce giants like Amazon, that pressure is passed down to their already-stretched suppliers. If you’re a mid-sized consumer goods brand, this pressure is compounded as you compete against billion-dollar companies that have the resources and infrastructure to more easily cater to retailer mandates. In addition to fighting the good fight in terms of pricing and promotion with retailers, you can partner with a third-party logistics provider (3PL) to give your company distribution services that rival your biggest competitors. Mid-size consumer goods companies can level the playing field with larger competitors through “coopetition” – working together with other firms, even competitors, to act as one large company. Load consolidation is an excellent example of coopetition. With this model, a 3PL that specializes in the consumer goods-retail supply chain can use specialized transportation management systems to consolidate loads from different companies. For instance, the system may identify three 3,000-pound shipments from three different companies moving to the same customer or region – all with the same delivery date. That freight can be consolidated onto one truckload shipment, either direct to the customer (the biggest saving) or to a regional pool point for local delivery. This is good for the shippers, who extend the lower-cost TL segment of the move, and good for retailers like Walmart, who reduce their own freight costs by receiving the same volume in one truck, not three. 3PLs who manage consumer goods distribution services for many mid-sized companies can help you identify consolidation partners. With cross-docking, incoming items are broken down upon receipt, matched with pending orders, and then immediately sent out for delivery. This drastically reduces delivery lead times, inventory, and costs related to storage, labor, and transportation. But, while it may not be easy, the payoff could be big. 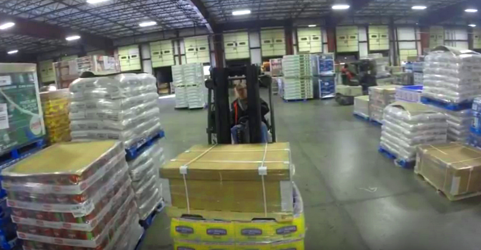 Cross docking makes for happy retailers as they will receive fewer, precisely timed shipments, requiring fewer dock doors and receiving staff. So, if you lack the systems and resources to effectively implement cross docking yourself, this is another key area in which a 3PL can help. So, where does this customization happen? Many CPG companies still ship product from the DC to outside packaging firms only to have the product return to the same DC. This increases freight costs and causes the company to lose visibility to the product during the packaging process. You can eliminate these problems by performing packaging and other product configuration functions right at the DC. Using this strategy, a 10%-15% savings is possible based on reductions in freight costs, inventory and damage. Additionally, product moves faster through the distribution cycle, enabling you to convert products to cash sooner. It’s becoming harder and harder for mid-tier manufacturers to compete. They just don’t get the mindshare with retailers that their large competitors do. And they don’t have the freight volumes necessary to drive supply chain efficiencies. But here’s where 3PLs can play a very strategic role, providing the advanced infrastructure that you need, but can’t afford to build. Look for a CPG logistics specialist with a dense concentration of like customers and a keen understanding of chargebacks, on-time in-full mandates, promotion support and other logistics issues that keep you up at night.